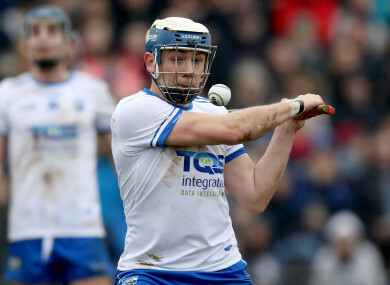 AFTER A DISAPPOINTING 2018 in both league and championship Waterford need to hit the ground running this year and they couldn’t have started in any better fashion than with this emphatic win over a hapless Offaly. Stephen Bennett took the opportunity afforded by poor opposition to mount an exhibition of scoring, 0-16 from play and frees, with some of his long-range efforts drawing gasps of admiration. DJ Foran looked sharp from the off, sending over two nice points in the first half while Stephen Bennett was reliable with the placed balls and also got a couple from play early on. Veterans such as Kevin Moran and Michael “Brick” Walsh caused many problems with some fine ball-winning and passing. It took Offaly 17 minutes to trouble the scoreboard, Kevin Connolly opening their account, and they had Eoghan Cahill between the sticks to thank for a couple of good saves which prevented goals by Thomas Ryan and Shane Bennett, while a well-struck ground stroke by Thomas Ryan in the 22nd minute went just wide of the post. At the break Waterford led by 0-12 to 0-5 but suffered a setback when Shane Fives, who had performed strongly until then, had to come off injured in the 33rd minute. If Offaly had any dreams of mounting a fightback they were extinguished barely.a minute into the second period when DJ Foran took possession on the right, rounded his man and sent a powerful shot past Cahill and into the net. Mikey Kearney and Stephen Bennett followed up with a string of fine points and the cause was lost for Offaly. Scorers for Offaly: Kevin Connolly 0-2, Aidan Treacy 0-2 (2F), Eoghan Cahill 0-2 (2F), Damien Egan 0-1. 23. Stephen Roche (Mount Sion) for K Moran (55). 21. Dylan Murray (Kilcormac/Killoughney) for S Kinsella (66). Email “0-16 for Bennett as Waterford hit the ground running with 27-point win over Offaly”. Feedback on “0-16 for Bennett as Waterford hit the ground running with 27-point win over Offaly”.